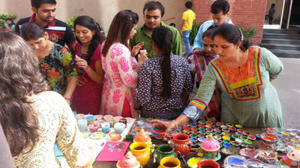 On 16th October, 2014, Dr. O P Bhalla Foundation in collaboration with NGO Prakash Deep organized a pre Diwali event, where students from Manav Rachna College of Engineering taught the students of NGO various skills to make decorative candles and diyas. The event was all about exploring the creative mind and enhancing the skills of the students by providing them a platform boosting up their confidence. The designed items by the students were then sold to people with help of technology. Outcome of the event helped the under privileged students earn a total of Rs. 7000/-. The Funds raised were deposited in the children’s account which is used to provide them with Uniforms and Stationery Items. The stationery, candles, Diyas and decoration materials required in the event was provided by the foundation.